Field Event Facilities: Full - 1 HJ, 1 PV (1L-SE), 3 LJ, 3 TJ (2L-ALT, 1L-SE), 1 SP, 1 DT/HT (2C-INT), 2 JT. There is also 1 SP (no board), 1 DT (no cage) external to the track. The track was originally cinder and opened on 30th May 1964 and was upgraded to synthetic in 1987 with 7 lanes all round an 8 lane home straight. It is set in a very pleasant location with trees surrounding most of the track. The two uncovered stands are quite old and some seats are missing. The track surface is relatively smooth and considered by some to be in need of replacing. 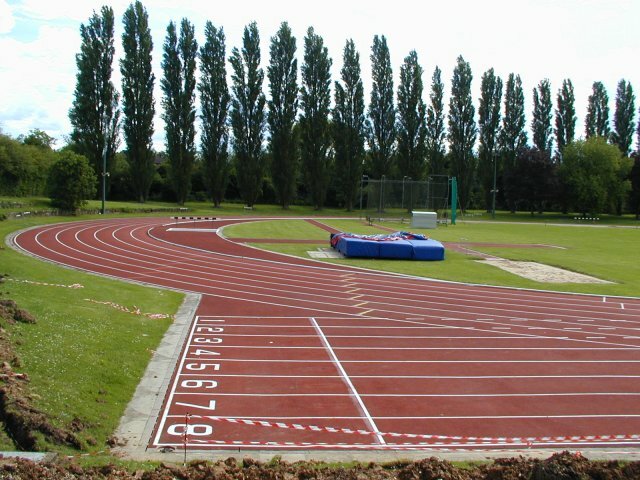 In 2003 the track was resurfaced and converted to 8 lanes all round with a 10 lane home straight. Further, the old LJ runways on the infield have been filled in, and a new double LJ runway has been built adjacent but outside the home straight.